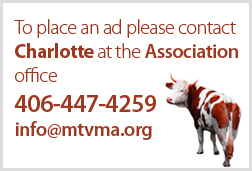 MVMA Members may post items for sale on this page at no charge by emailing Charlotte the posting: [email protected]. The posting will remain up for 3 months. Please click here for non-member pricing. Looking for a used centrifuge - please email Dr. Jeanne Rankin if you have one: [email protected] or 406-465-5142.